Last Friday I spent my morning with Champions. 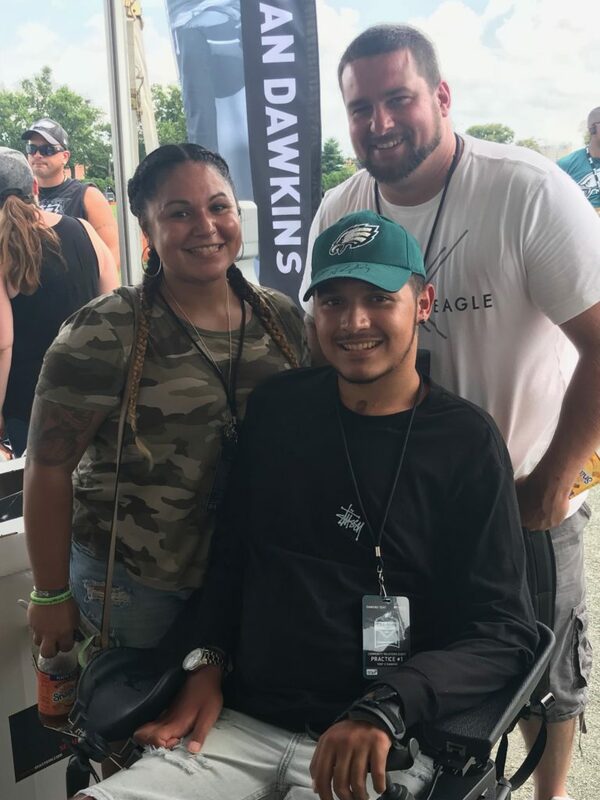 I had the honor of attending the Training Camp of the World Champion Philadelphia Eagles thanks to Debbie Savigliano and her incredible organization, Bianca’s Kids. 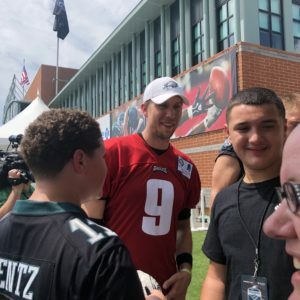 As a lifelong Eagles fan, this truly was a dream come true for me! 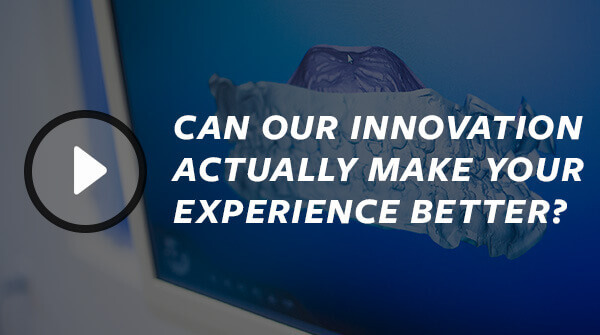 Active involvement in the local community and service to those in need has always been one of my core values, and it has been an integral part of Innovative Orthodontics since I founded it in 2007. Over the years, we have donated thousands and thousands of dollars to national charities, community groups, local schools, youth sports teams, etc. Simply put, we love to give back to the community and people who have given us so much. But a few years ago, my life changed forever. I met Debbie Savigliano, the founder of Bianca’s Kids — a non-profit organization based right here in South Jersey whose mission it is to grant wishes to children in need. 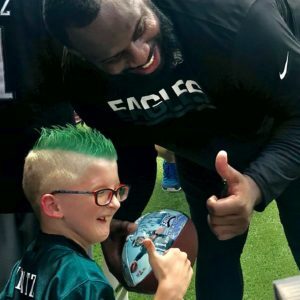 I knew right away that this was more than a charitable organization — it was the vehicle to give back to local kids in need that I have been searching for my whole life. Last year, my wife Emily and I donated $10,000 to Bianca’s Kids, and we plan to do so for as long as we possibly can. 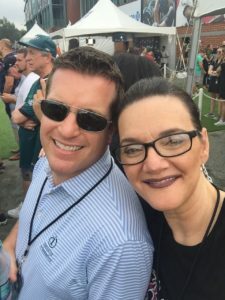 As a thank you, Debbie invited me to the Philadelphia Eagles’ Training Camp last Friday. It was a gift for which I will be eternally grateful. I got to meet Giovanni. 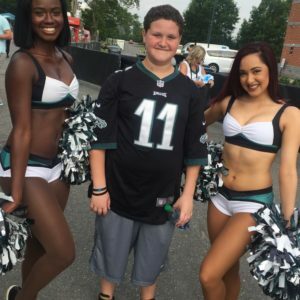 He is a 10 year old boy with Schwartz Jamel Syndrome (SJS), a genetic disorder that affects bone and muscle development. 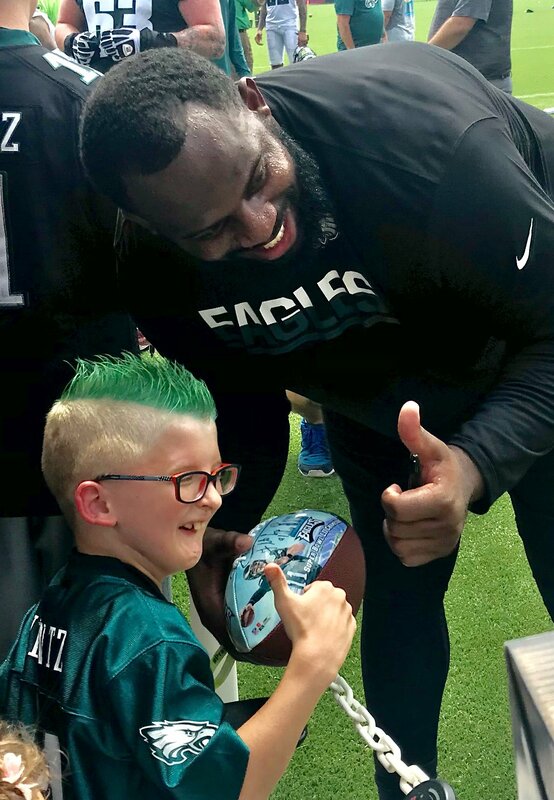 He is advocate for other kids with SJS, and is one of the biggest Eagles fans I have ever met. 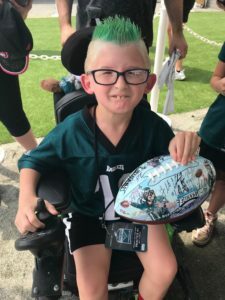 His Eagles-green spiked hair and infectious smile lit up the training facility, and he made it clear that being at Training Camp that day was a dream come true for him. I got to meet Jevon, a local 12 year old boy with Type 1 Diabetes who has struggled with being bullied. 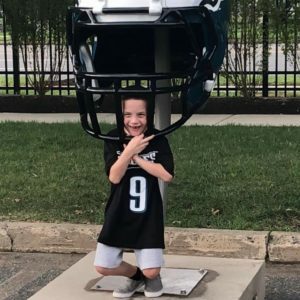 He is an incredibly positive and inspiring young man who now spends his time speaking to younger kids with Juvenile Diabetes about how to cope with the disease. 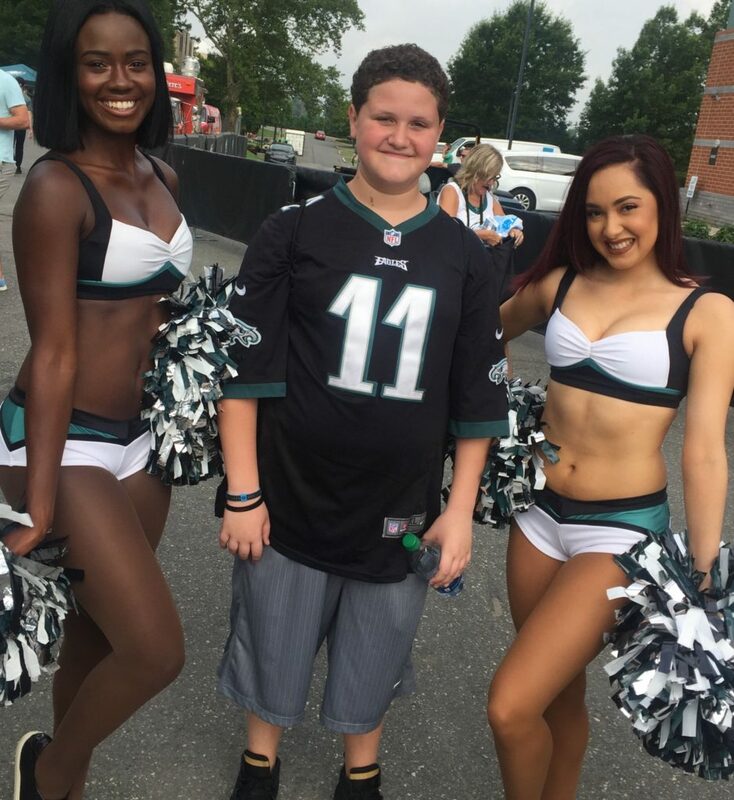 He plays football and dreams of becoming a Philadelphia Eagle someday. I got to meet Anthony. He is a professional tumbler who attempted to avoid landing on a fellow tumbler during a trick. One misstep and a bad landing left him paralyzed. 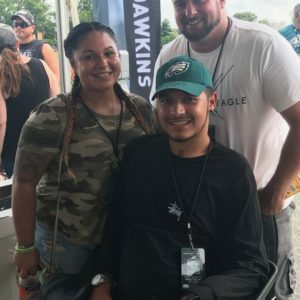 He has turned tragedy into triumph and is going to college to study public speaking so he can speak to the world about spinal cord injury recovery. I got to meet AJ. 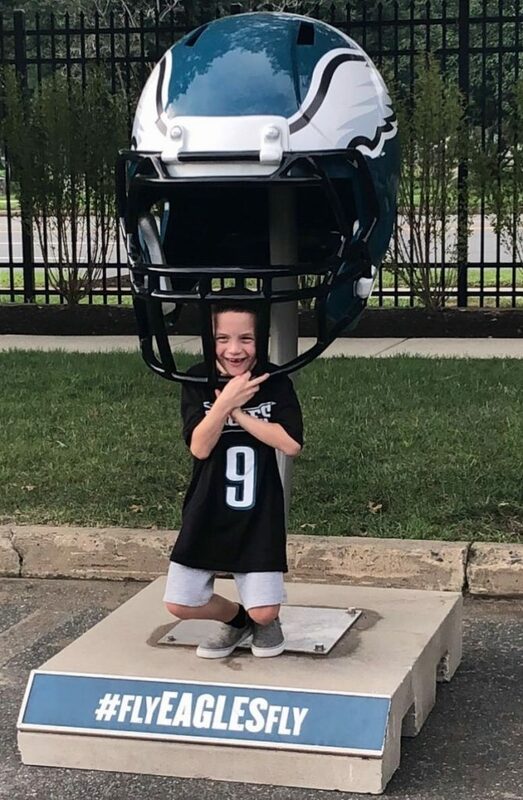 AJ has a rare connective tissue disease called Fibrodysplasia Ossificans Progressiva (FOP), which is commonly known as “Stone Man Disease”. This is an extremely rare connective tissue disease caused by a mutation of the body’s repair mechanism, which causes fibrous tissue (including muscle, tendon, and ligament) to harden spontaneously or when damaged. 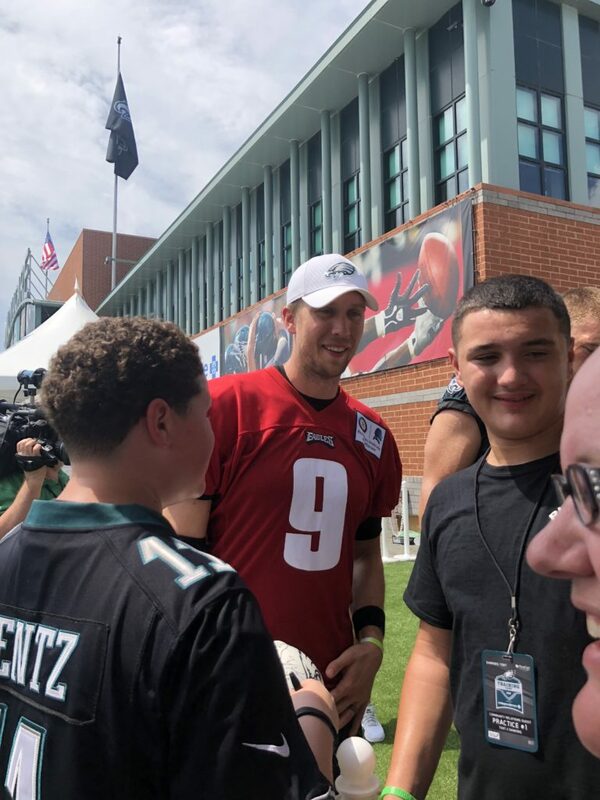 Being at the Eagles’ Training Camp and meeting some of his heroes was a dream come true for AJ, and he did not stop smiling the entire day. I got to see Debbie and her incredible crew at Bianca’s Kids grant wishes and make dreams come true for kids who truly needed it. I found myself choking back tears at multiple points throughout the morning. They are truly some of the kindest and most genuine people I have ever met. They are an inspiration to me in every sense of the word, and they make me want to be a better person to live up to the incredibly high standard of good-will and generosity that they have set. 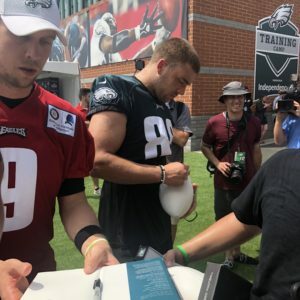 I spent my entire morning at the first full Eagles’ practice since they won the Super Bowl. I was surrounded by Champions and in the presence of greatness. 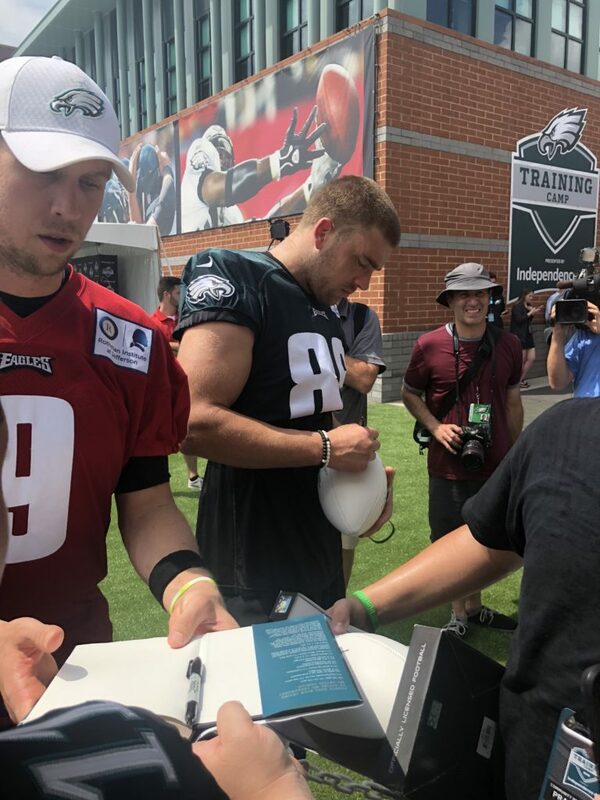 And I almost forgot — I also got to meet some of the Philadelphia Eagles. Thank you for such an amazing overview of what Debbie and Bianca’s kids do for the community and the wishes they grant children. I appreciate your contributions to the community and acknowledgements you give to those who are truly humble. So well written and from the heart , I’m sure Debbie is beaming with the same joy she gives to her recipients. Beautiful !